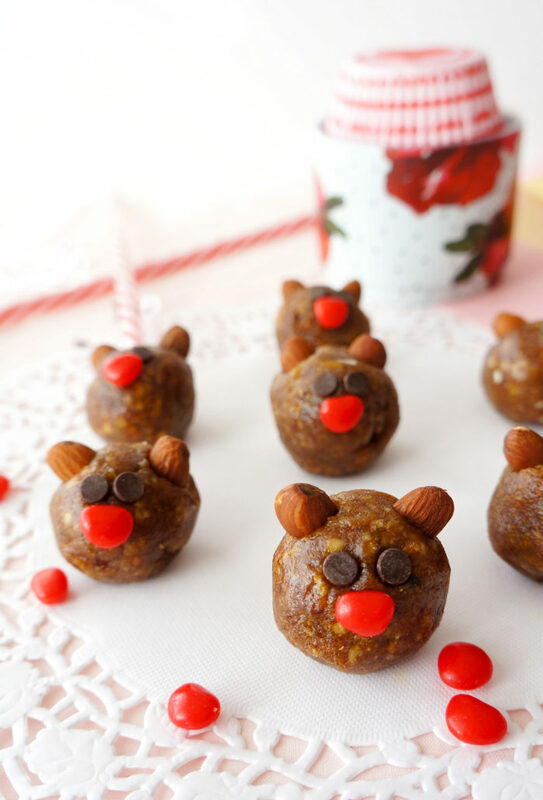 These Valentine’s energy ball bears are a cute, fun and healthy treat, perfect for V-Day! So. How cute are these energy bears?! 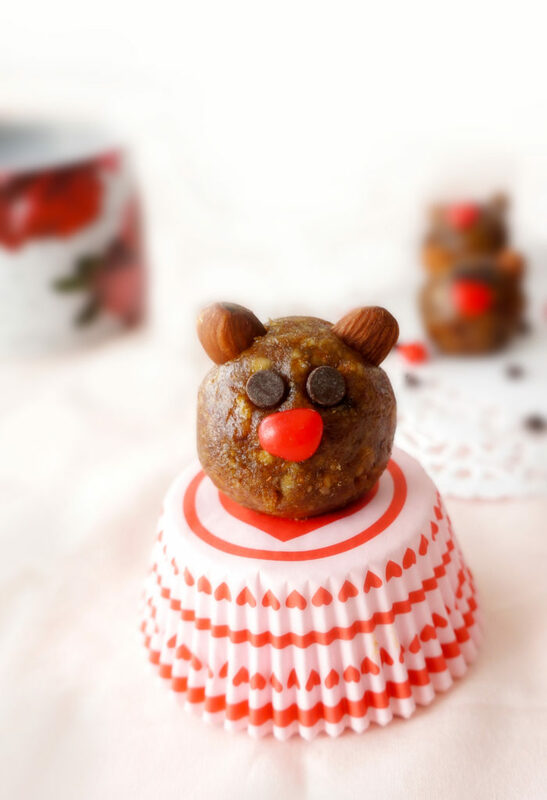 I was wracking my brain trying to come up with a fun and healthier Valentine’s day treat for a kids event I had last week…you know, something beyond the typical energy balls or fruit skewers. Enter these little energy ball bears. An energy ball that has been transformed into a cute little teddy bear. Just looking at them instantly brings a smile to my face. The funny part is, when I tested them out at my event, the kids loved them, but I think the adults loved them even more! Everyone who encountered these bears broke out into a huge smile, both before and after eating them! The kids loved rolling up the head and sticking the ears, eyes and nose on the bear and then gobbling it all up. 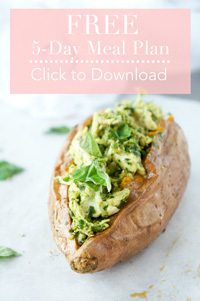 The ingredients list is simple, so they’re super easy to make. Plus they’re a good source of fibre, magnesium and healthy fats! You can even make up a big batch and store them in the freezer for a healthier snack on the go. Hope you enjoy these cute little bears!! Place dates in a bowl of boiling water for approximately 10 minutes. Drain the dates. Add the almonds and cashews to the bowl of a food processor. Pulse until nuts are finely chopped. Add the dates and coconut oil. Pulse until the dates are finely chopped and the mixture starts to clump. If the mixture is too dry, add water one tablespoon at a time until it comes together. 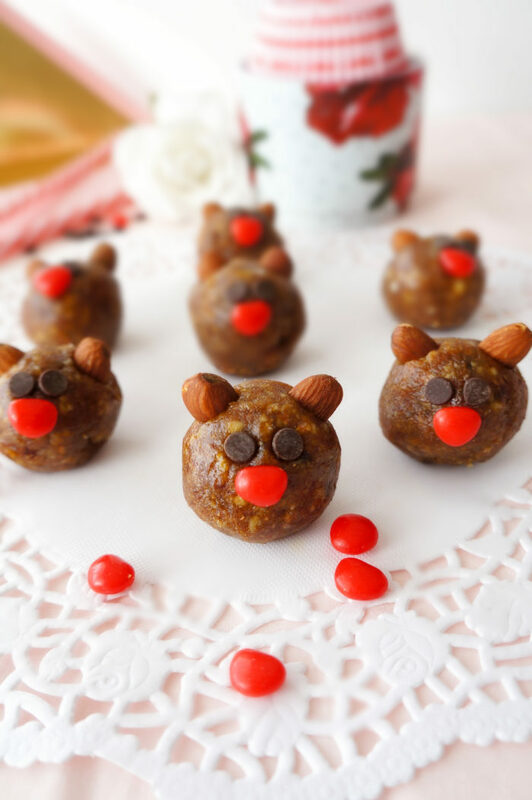 Shape the mixture into 1½ inch balls and use halved almonds for ears, cinnamon hearts for nose and mini dark chocolate chips for the eyes. Store in an airtight container in the refrigerator or freezer. Love these little energy bears, so cute…great IDEA! Thank you! They’re fun to make too!